joy magnetism: "Terrible passions of humanity"
I love when my magnets tell a story, or have a story themselves. This Van Gogh is at the Yale University Art Gallery, where I picked up this magnet. Such an awesome painting - I just love looking at it. It's a little painful on the eyes because of the bright yellows and the reds, combined with the greens - Van Gogh said he was trying to show the "terrible passions of humanity" through those colors. In truth, it's a sad little painting - it's supposed to be this place where people are socializing and having fun...and yet, everyone looks sad and miserable, in their own space. People love the painting for the perspective of it, that it draws you in so well, so much so, that you're staring right at the door in the back, wondering what's going on over there. 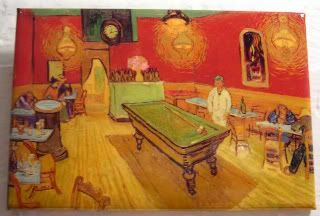 I just love that Van Gogh stayed up for 3 nights in a row in 1888, trying to capture this scene, of a cafe that was open all night in Arles, France. It's arguably one of his most famous paintings. I don't honestly know that to be true, because I do feel like there are several others that more people recognize. Still, I do like it. And, I also like that his pal Gauguin, also painted the same cafe, but from a totally different perspective. Ya'll know how I love that all those guys hung out. Anyway, I just found out tonight that it's been at the heart of some controversy over the last year - by the early 1900s, the painting was sold into a Russian collection, and with all the government upheaval, it then became something like a ward of the state...the state which sold the painting on the open market in the 1930s, as a way to raise money for the government. A wealthy New Yorker bought it, and upon his death, gave it to his alma mater, Yale, where it's been ever since. But, the kicker is that a descendant of the original Russian owner was like, dudes, that's my painting, and the government had no right to sell it, and therefore it was his. And, of course, Yale countersued for their rights, and they won. So, there it sits, on a huge giant wall at this quiet museum. I do find this kind of ironic, there's something really funny about the hottentotty of Yale and all its visitors, staring at the night cafe full of drunk degenerates and prostitutes.